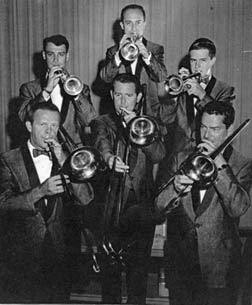 Fred Waring and the Pennsylvanians Brass Section (Sept 1960). Top from left: Allan Dean, John Bova, Jack Gillespie. Bottom from left: Marvin Long, Felix Mayerhofer, Bob Jenney.